This is our table from earlier in the week, measured via a 90 day long mail/holdout test of catalog marketing and email marketing. There are many nuggets of information in the table. Let's summarize how each channel is impacted by catalog marketing and email marketing. Paid Search: We generate $2.00 per customer via Paid Search in the quarter. Catalog causes $0.72, or 36% of Paid Search volume to happen. Email causes $0.18, or 9% of Paid Search volume to happen. 55% of Paid Search demand is independent of Catalog or Email marketing. We have to attribute 36% of Paid Search volume/cost back to catalog marketing, and we have to attribute 9% of Paid Search volume/cost back to email marketing. Natural Search: We generate $2.00 per customer via Natural Search. Catalog causes $0.58, or 29% of Natural Search volume to happen. Email causes $0.18, or 9% of Natural Search volume to happen. 62% of Natural Search demand is independent of Catalog or Email marketing. Affiliates: We generate $0.50 per customer via Affiliates. Catalog causes $0.34, or 68% of Affiliate demand to happen. Email causes $0.10, or 20% of Affiliate demand to happen. 12% of Affiliate demand is independent of Catalog or Email marketing. We have to attribute 88% of Affiliate marketing costs back to catalogs or email campaigns. Since Affiliate marketing is directly tied to Catalogs/Email, we need to strongly consider if the demand will continue to happen if Affiliates are dropped? 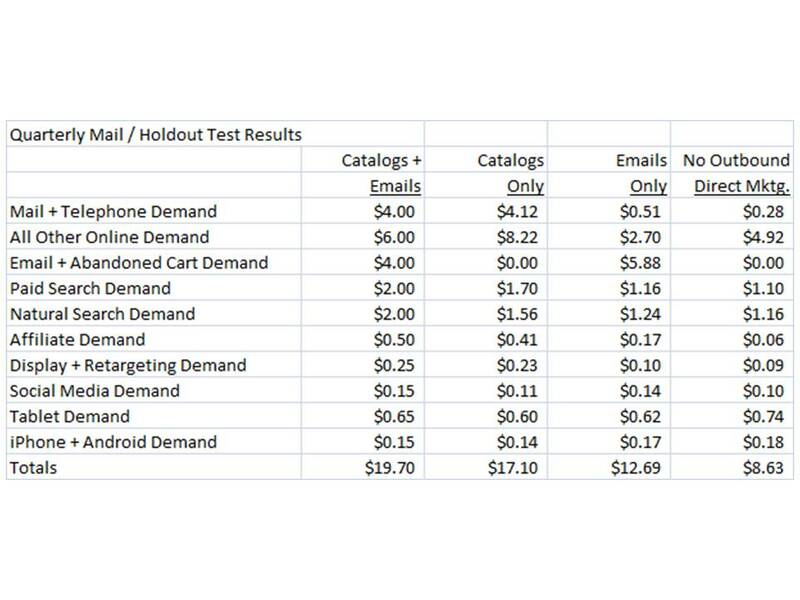 Catalog causes $0.15 per customer of Display demand to happen (60%). 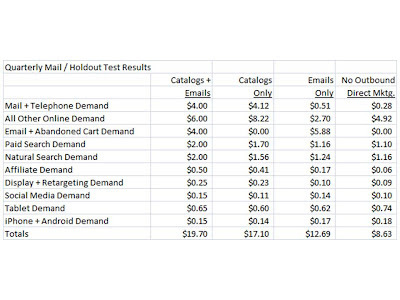 Email causes $0.01 per customer of Display demand to happen (4%). 36% of Display demand is not driven by other marketing activities (36%). We have to attribute 60% of Display costs back to the catalogs that caused the demand to happen. Social Media: We generate $0.15 per customer via Social Media. 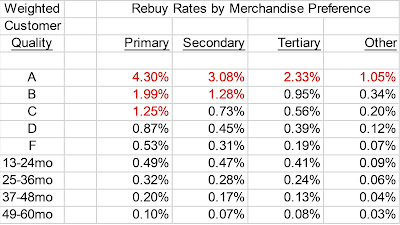 Catalog causes $0.01 per customer of Social Media demand to happen (7%). Email causes $0.04 per customer of Social Media demand to happen (27%). 66% of Social Media demand happens independent of Catalog/Email. Given the strong link between Email and Social Media, there should be some level of integration between the two channels. Social Media, to some extent, depends upon a strong email marketing program. Tablets: We generate $0.65 per customer on Tablet devices. Catalogs cannibalize $0.06 of demand from Tablet devices. Email cannibalizes $0.04 of demand from Tablet devices. In other words, when Catalogs/Emails are sent, customers shift their focus away from Tablet devices, and instead spend money in other channels. When Catalog/Email activities are not happening, customers shift their attention back to Tablets. This strongly suggests that, in the future, when customers spend more and more time with Tablet devices, this business will be able to scale back a bit on Catalogs and Email marketing campaigns, because the demand will be recaptured by Tablet devices. Mobile: We generate $0.15 per customer on Mobile devices. Catalogs cannibalize $0.03 of demand from Mobile devices. Email has no impact on Mobile devices. In other words, when Catalogs are sent, customers shift their focus away from Mobile devices, and instead spend money in channels congruent with Catalogs. At this time, Mobile is a very tiny portion of the total story. In the future, we need to watch this relationship, to see if it continues. If the relationship continues, the data strongly suggest that we can cut back a bit on Catalogs, because demand will reallocate to Mobile devices. At minimum, the attribution process should include three things. Mail/Holdout Testing, where applicable. 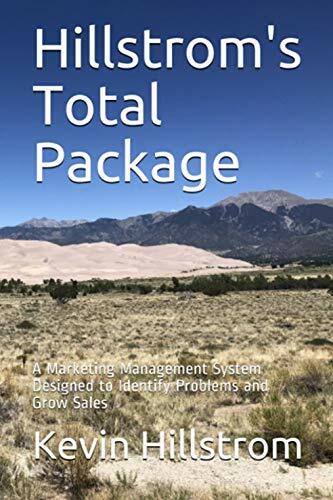 For catalog marketing and email marketing, this couldn't be easier. For Display Ads, this couldn't be easier. For Paid Search, you can vary your budget and compare the impact. Modification of Ad Cost by Channel. In our example, paid search costs should be moved from the paid search budget to catalog marketing, and to email marketing. Too often, we don't focus on this aspect of attribution. Mail/Holdout tests illustrate why we need to do this. Business Intelligence. The goal of any attribution project should not be to just allocate demand/expense, but should be to teach every employee how channels fit together. We just don't do enough of this, do we? How often do we step back, and try to teach employees how our business works? Contact me (click here) for additional assistance with attribution work.